Kettle Bells Will Soon Be Ringing! It is nearly that time of year where we’ll be out on the streets ringing the kettle bells to encourage our community to partner in our biggest fund raising campaign of the year. Our Christmas Kettle Campaign enables us to carry out our important work in the community throughout the rest of the year such as our food bank, soup kitchen, school packs, healthy babies program, kids camp and emergency support services. The famous Salvation Army kettle has been around since Captain Joseph McFee, in an effort to help the vulnerable people of San Francisco in 1891, suspended a pot at the Oakland Ferry Landing and encouraged the public to “Keep the Pot Boiling. Help us bring Christmas Cheer to the needy.” The first Christmas Kettle was seen in Canada in 1903 in Toronto and now at more than 2,000 locations nationwide. We have some exciting developments for 2018 as this year we are planning to increase our kettle locations to new sites within our Ministry Area, we’ve got an exciting Hope Bracelet contest for our kettle donors, we’re planning to introduce some “cashless kettles” and we’ll be hosting our first annual Christmas Kettle Kick Off event on November 27th at the Parksville Community and Conference Centre. As well, all of our Christmas kettle shifts are available online to view or sign up as fits your availability on our Christmas Kettle Hub. 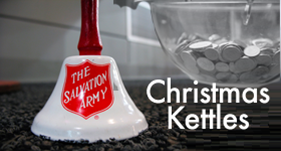 Should you have any questions or be looking for additional information, our Christmas Kettle Coordinator would be happy to assist you at kettles@nullparksvillesalvationarmy.ca or 250-240-4711.